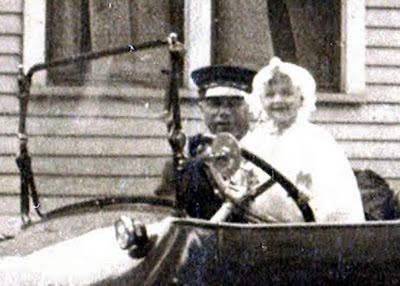 Over the summer, I found this antique photo of a child playing in a magnificent automobile while a tolerant chauffeur looks on. Usually I only collect old photos of children with toys, a natural extension of my antique toy collecting. But this picture was just too captivating to pass by. And after all, the child is playing in the car, so perhaps we can consider it a toy, albeit a very expensive one. It took me awhile to get the car identified, but I'm told by my local "car guy" that it's a Stearns, made by the luxury automobile manufacturer F.B. Stearns of Cleveland, Ohio. Stearns cars were originally in production from 1898-1925, when the company was sold to J.N. Willys of Willys Overland fame. Willys continued making Stearns models until 1929, when they liquidated the company. 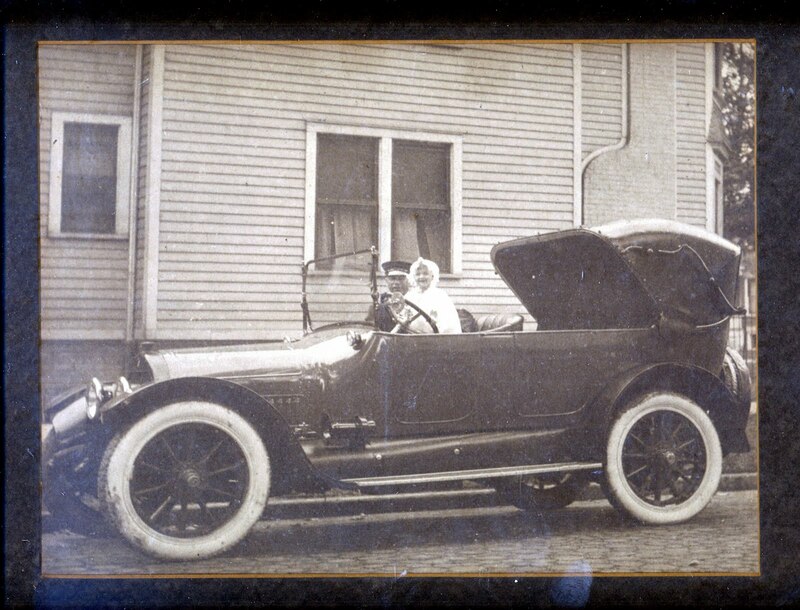 I'm not sure of this car's date: I've seen pictures online of similar Stearns ranging from 1908-1920s. (Any Stearns experts out there who can identify it, feel free to write me!) In 1906, a typical Stearns auto sold for an astronomical $5,200, which explains the presence of the chauffeur: if you could afford this car back then, you probably had an estate with a substantial domestic staff. The picture has a label on the back saying it was framed at Crowley, Milner & Company, a Detroit department store that was founded in 1909, so it's a pretty safe bet that this photograph was taken in a posh area of Detroit like Indian Village or its luxurious neighbor, Grosse Pointe. That's one happy, happy kid. I would be, too, if I had a chauffeur to drive me everywhere! Your car is actually a 1916 Cadillac. I enjoyed the picture> Lots of energy in the child.